Bose, N., Zee, T., Kapahi, P. and Stoller, M. L. (2017). Mass Spectrometry-based in vitro Assay to Identify Drugs that Influence Cystine Solubility. Bio-protocol 7(14): e2417. DOI: 10.21769/BioProtoc.2417. Cystinuria is a rare genetic disorder characterized by recurrent, painful kidney stones, primarily composed of cystine, the dimer of the amino acid cysteine (Sumorok and Goldfarb, 2013). Using a mouse model of cystinuria, we have recently shown that administration of drugs that increase cystine solubility in the urine can be a novel therapeutic strategy for the clinical management of the disease (Zee et al., 2017). There is a large unmet need in the field for developing new drugs for cystinuria. To that end, here we describe a simple in vitro cystine solubility assay that is amenable for screening compounds to identify potential drugs that may influence cystine solubility. The assay includes preparing a supersaturated solution of cystine, incubating this solution with drug(s) of choice, and finally using high pressure liquid chromatography–tandem mass spectrometry (HPLC-MS/MS) to quantify the amount of cystine precipitated under various conditions. Cystinuria is a type of kidney stone disease characterized by a genetic defect in cystine transporters in the proximal tubule of the kidney, resulting in massive increase in cystine load in the urine that precipitate as kidney stones (Sumorok and Goldfarb, 2013). While categorized as a rare genetic disorder (~1/15,000 individuals) (Milliner and Murphy, 1993; Palacin et al., 2001), patients suffering from cystinuria experience excruciating pain from recurrent stone episodes (Dent and Senior, 1955). Unlike other, more common kidney stone types (such as calcium oxalate- or uric acid-based), cystine stones are denser and resistant to extracorporeal shock wave lithotripsy (SWL), requiring patients to undergo multiple emergency room visits and surgical procedures to remove obstructive stones (Mattoo and Goldfarb, 2008). The current drug regimen for cystinuria are geared towards either increasing urinary pH (potassium citrate) or reducing urinary cystine levels (thiol drugs, such as tiopronin), which are generally associated with serious side effects (Koraishy et al., 2013; Sumorok and Goldfarb, 2013; Saravakos et al., 2014). Further, clinical (Becker et al., 2007) and murine model (Zee et al., 2017) studies have found little evidence that these drugs are ultimately effective and long-term patient compliance is poor. Thus, there is an urgent need for developing effective therapies to treat cystinuria. Our recent results show that increasing urinary cystine solubility can be a viable alternative strategy for drug development in cystinuria. Herein, we describe an in vitro cystine solubility assay to identify novel compounds capable of influencing cystine solubility. Manufacturer: GLASSCOLABS, catalog number: 007.470.05A . Note: Specific brand and catalog number (as used in our work) have been provided for the materials and reagents listed. However, we do not explicitly endorse any of these brands or products and most items can be obtained from other reputed vendors. Further, most of these product/catalog numbers are based on the current availability in the United States, so researchers in other countries may find it necessary to obtain materials from another vendor. Note: Standard lab equipment should be used for this assay as indicated. Specific brand and catalog numbers (as used in our work) have been provided for components of the HPLC-MS setup–these can be replaced by equipment from other vendors; arguably any HPLC-MS setup will work with this assay, but may need additional optimization based on vendor-provided instructions. Prepare 2 L of 20 mM ammonium acetate in HPLC-grade water. This will be used for HPLC sample preparation, as well as to make one of the HPLC mobile phases. Note: 2 L is a suggested volume, adjust based on the anticipated number of drugs being tested. Adjust pH of this solution to ~9.0-9.5 (this does not have to be accurate or reproducible) by adding ammonium hydroxide in batches of ~0.5 ml followed by pH measurement. A standard pH meter can be used for the purpose; however, it is recommended that the pH probe not be dipped directly in the solution. Instead, a small aliquot (~0.5-1 ml) should be transferred to a culture tube for each round of pH measurement. Caution: Ammonium hydroxide is highly corrosive; gloves, safety goggles, and lab coat should be worn at all times while handling this compound. It is also advisable to handle it only inside a chemical safety hood. Measure 950 ml of this pH-adjusted 20 mM ammonium acetate solution in a clean glass bottle (1 L) and add 50 ml of acetonitrile (ACN), using appropriate glass cylinders. This will be used as mobile phase A for HPLC. Note: This solution can be stored for ~2 weeks at room temperature. Bottles and glass cylinders should be thoroughly cleaned first with HPLC water and then with ACN prior to their use (detergents/soaps should be strictly avoided). Measure 1 L of ACN to another clean glass bottle (1 L). This will be used as mobile phase B for HPLC. Note: ACN can be stored in the dark at room temperature and used for up to 6 months. Take 400 ml pH-adjusted 20 mM ammonium acetate solution (from step A2) in a 500 ml glass bottle. Weight out ~29.2 mg of 3,3,3’,3’-d4-L-cystine (referred to as d4-CC) into this solution and mix well to dissolve and generate a 300 µM solution of d4-CC. Note: This solution can be aliquoted and stored for several months at -20 °C. Prepare adequate amount of 30 µM d4-CC solution from this 300 µM solution of d4-CC, by diluting (10 folds) with pH-adjusted 20 mM ammonium acetate solution (from step A2). Note: This solution should be prepared fresh for each batch. 3.6 ml of this solution will be used as internal standard per vial used in the assay–calculate the amount required based on the number of drugs (and replicates) being tested. Prepare 500 µl each of 2.5 mM and 250 µM solutions of DL-cystine dimethyl ester (CDME) in HPLC-grade water (5x). CDME is used as a positive control for the assay as it has been shown to significantly increase cystine solubility (Rimer et al., 2010; Zee et al., 2017). Prepare test drugs solutions (5x): weigh out test drugs and dissolve in HPLC-grade water to achieve concentrations 5 folds higher than intended for testing; in the course of the assay, this will be diluted to 1x. Caution: The drugs may pose health and/or environmental hazards; thus, they should be handled with proper safety precautions. Prepare the positive control vials (4 replicates each): two sets of 4 x 4 ml glass vials with 100 µl each of 2.5 mM and 250 µM solutions of CDME (from step A7). In the course of the assay, this will be diluted 5 folds to achieve a final concentration of 500 µM and 50 µM CDME respectively. Prepare the negative control vials (4 replicates each): one set of 4 x 4 ml glass vials with 100 µl each of HPLC water. Prepare the drug vials (4 replicates each): one set of 4 x 4 ml glass vials with 100 µl each of 5x drug solution (from step A8). In the course of the assay, this will be diluted to 1x. For steps A9-A11, at least 3 replicates (ideally 4 replicates) per condition should be used. Borosilicate glass vials as indicated are absolutely required for this step; plastic vials are not compatible with this assay. Weight out ~96 mg of L-cystine (referred to as CC) in a round bottom flask and add 100 ml of HPLC-grade water to achieve a final concentration of 4 mM of CC. Wash round bottom flask thoroughly with HPLC-grade water, ACN, and water again. Avoid the use of soaps/detergent. CC will not dissolve at this stage. 100 ml is a suggested volume, adjust based on anticipated number of drugs being tested. Here is an exemplary scenario when 10 drugs are being tested at two concentrations (4 replicates per condition): in this case, one will have 80 drug vials (10 drugs x 2 concentrations x 4 replicates each) and an additional 12 vials for the positive and negative controls to be used in each setup (see steps A9 and A10), i.e., a total of 92 x 4 ml vials. For such a setup, one would need a total of 92 x 400 µl, i.e., 36.8 ml of 4 mM CC solution (vide infra, step C1). Thus preparing 50 ml of solution for reflux (by weighing ~48 mg CC) would suffice. To this add a magnetic stir bar (of suitable size). Attach the round bottom flask containing the stir bar and CC suspension to a reflux apparatus. Securely attach the flask to the Allihn condenser using clips and turn on the water flow through the condenser jacket. Ensure that a steady (but not vigorous) flow of water is achieved through the condenser. Note: Refluxing refers to the process of heating a solvent (or suspension) to its boiling point and allowing the evaporated solvent to condense back into the original flask, most often using cold water flowing through an Allihn condenser. Refluxing ensures that the solvent (or suspension) is constantly maintained at its boiling point (a fixed temperature), for a prolonged period, without any significant solvent loss due to evaporation. Caution: The reflux apparatus should be set up inside a chemical safety hood. The process requires heating at high temperatures, thus appropriate safety precautions should be taken. When the water stream through the reflux condenser is steady, turn on the stirring and the heating. It is preferable to stir at a moderate speed (based on individual stirrer settings) and heat at a temperature slightly above the boiling point of water (~105-110 °C). Monitor the flask closely (every 2-3 min) for water droplets forming at the bottom of the condenser; when the first (approximate) condensed water droplet falls back in the flask, mark the time as the start of refluxing. Reflux the CC suspension for ~20 min, or until all the CC has dissolved to generate a 4 mM supersaturated CC solution. Turn off the stirring and heating. Remove heating mantle from under the round bottom flask. Caution: Both the mantle and the flask will be extremely hot–use of heat-protective gloves and lab coats are strongly recommended. Let stand for 30-40 min or until the supersaturated CC solution is cooled to almost room temperature, without disturbing the solution. Note: Constant water flow through the reflux condenser is still required throughout the process. When the supersaturated CC solution from step B8 is cooled to almost room temperature, carefully detach the Allihn condenser from the flask. Using a pipette transfer 400 μl of this solution to each of the control (positive and negative) as well as the drug vials prepared in steps A9-A11. Note: This step should be completed immediately after B8. Also, make sure not to disturb the supersaturated CC solution unnecessarily, i.e., any more than required for the transfer, otherwise CC may crash out. Briefly vortex each vial to homogenize the contents. Incubate vials at 4 °C in an incubator or a fridge for 48-72 h (ideally one that maintains consistent temperatures without much fluctuations). At the end of the incubation period, centrifuge the vials at 1,300 x g at 4 °C for 15 min. Carefully remove as much of the supernatant from each vial with a 1 ml pipette, without disturbing the crystalline CC precipitate. Next, using gel loading tips and a suitable pipette, remove the remaining supernatant without drawing up any of the precipitated cystine particles. Discard the supernatant. Note: This step requires some practice to effectively remove all supernatant while keeping behind most of the CC particles; we recommend a couple of practice runs with the positive and negative controls before running drug experiments. Caution: The supernatant may contain hazardous drugs/chemicals; thus disposal of the supernatant should be done according to respective institute guidelines. Add 3.6 ml of the 30 µM d4-CC solution (prepared in A6) using a 1 ml pipette to each vial (4 x 900 µl transfers to each vial). Vortex well to combine the contents. The precipitated CC may not dissolve at this stage completely. Freeze the solutions at -20 °C. Step C8 is necessary to dissolve the precipitated crystals of CC. In our experience, simply leaving the vials at a -20 °C freezer works best. Attempting to speed up the process by using dry ice or liquid nitrogen results in the glass vial cracking and thus not recommended. The vials can be stored anywhere between a few hours to several months at -20 °C. When ready for analysis, thaw the contents of the precipitation vials (step C8) at room temperature. Once at room temperature, vortex the vials briefly and carefully inspect each vial for remaining CC precipitates. Ideally all vials should have clear solutions at this point. Note: Following the steps as indicated, we have never experienced residual precipitates at this stage. Nonetheless, it is possible that certain drugs may decrease CC solubility such that a lot of CC precipitates during the incubation and not all go back in solution. In such cases, it will be necessary to transfer the vial contents (including any remaining precipitate) to larger tubes, add more HPLC-grade water (the d4-CC will normalize any dilution effects during mass spectrometric quantification), and redo steps C8 and D1 for these vials. Transfer 1 ml of the clear solution from each 4 ml vials to prelabeled HPLC autosampler vials. Prepare a blank vial with 1 ml HPLC-grade water, as well as an internal standard vial with 1 ml of the 30 µM d4-CC solution (prepared in A6). Optimize multiple reaction monitoring (MRM) transitions for CC and d4-CC. This includes determination of compound-specific precursor and product ions and optimal MS parameters for each transition (Q1, precursor→Q3, product), achieved by isocratic flow injection of the 10 µM solution for each compound. Label the most intense (Q1→Q3) transition as quantifier and the next best transition as qualifier for each compound (see Table 1). Note: DP = Declusturing potential, EP = Entrance potential, CE = Collision energy, and CXP = Collision exit potential. 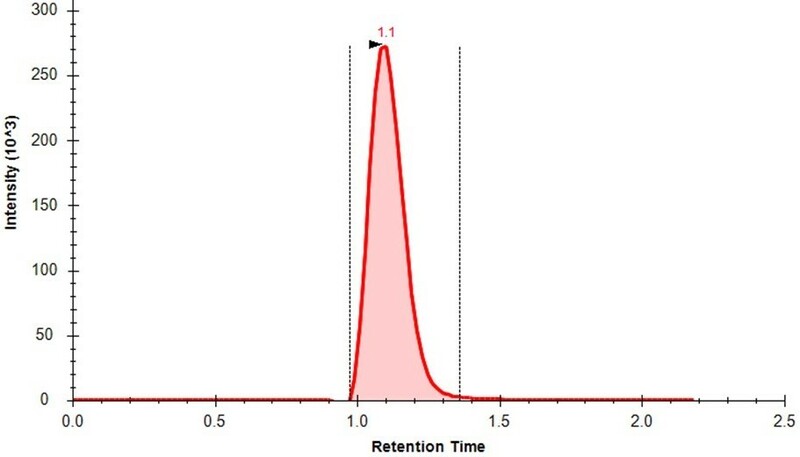 For LC separation, use a solvent gradient of 95% of 20 mM ammonium acetate (pH ~9.0-9.5) in water and 5% acetonitrile (mobile phase A)–ACN (mobile phase B) at a flow rate of 0.8 ml/min, starting with an acetonitrile content of 55% for 0.25 min, decreased to 2% at 1.15 min and held at 2% until 1.65 min. Reconstitute the LC column subsequently to its initial condition over the next 0.1 min and re-equilibrate for 0.5 min. Under these conditions, CC and d4-CC elute at a retention time = 1.1 min with our HPLC setup. The LC Column is maintained at 35 °C for the analysis. Operate the mass spectrometer in positive ion mode with the following source conditions (specific to AB Sciex’s 4000 QTRAP instrument): curtain gas (CUR) 20, nebulizer gas (GS1) 30, auxiliary gas (GS2) 30, ionspray voltage (IS) 4,500 V, and source temperature (TEM) 450 °C. Run the blank sample first, followed by the internal standard sample, and followed by the rest of the assay samples. It is also recommended to run a blank between each type of samples, e.g., blank–4 replicates of Neg control–blank–4 replicates of 50 µM CDME–blank–etc. Please consult a mass spectrometrist or the University/Institute’s mass spectrometry core for help with these steps. The steps pertaining to mass spectrometry are provided specifically for use with a triple quadrupole-type instrument. Other mass spectrometers and/or simple scanning m/z of the molecular ions of CC (241) and d4-CC (245), instead of MS/MS detection, may also be used. Quantify the amount of CC precipitate in each vial by computing the area under the curve (AUC) for the quantifier peak of CC. Figure 1 shows an exemplary AUC, which acts as a surrogate for the CC quantity in the sample. See also Note 3. Figure 1. Extracted ion chromatogram (XIC) for the MRM transition (m/z 241.1→152.0) representing cystine (CC). The red shaded area shows the area under the curve (AUC) for CC in this sample, which is proportional to the quantity of CC in the sample. Normalize the AUC with the corresponding area under the curve for d4-CC peak, to obtain nAUC values. These nAUC values may be used as surrogates for the amount of CC precipitate in each vial. Compare the normalized negative control nAUC values with that of drug or CDME nAUC values (obtained in step E2), using standard statistical analysis methods, such as Student’s t-test (see Figure 2). CDME is used as a positive control. 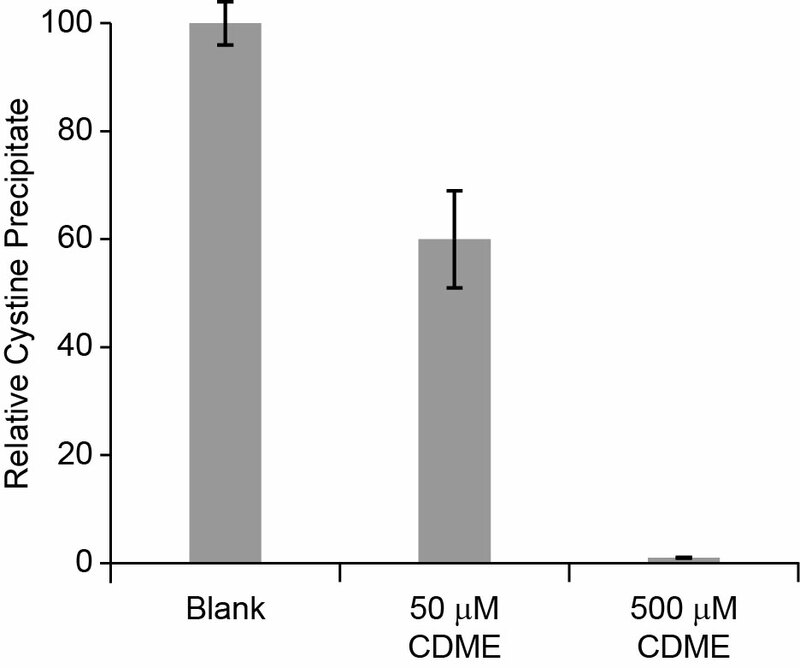 In our experience, 500 µM CDME results in almost no CC precipitate and very low nAUC, whereas 50 µM CDME results in a moderate amount of precipitate, resulting in modest reduction of nAUC as compared to the blank (Figure 2). Any drug that results in significant reduction of nAUC values as compared to the blank should be considered for further investigation, such as testing in the mouse model of cystinuria (Zee et al., 2017). Figure 2. Relative yield of L-cystine precipitation obtained after crystallization in the presence of water (blank) and L-cystine dimethyl ester (CDME, 50 and 500 µM), a positive control. Error bars are SD. We have generally found this assay to be reproducible, so long as the incubation temperature (step 3C) is reasonably consistent between multiple experiments. Use of HPLC-grade water is highly recommended wherever possible. D4-CC (3,3,3’,3’-d4-L-cystine), a commercially available isotopolog of cystine (CC) has been used in the protocol to aid in CC estimation. As with most isotopologs, CC and D4-CC are chemically nearly identical; thus, they have similar chemical and physical properties (such as solubility). However, in a mass spectrometry experiment, they are easily distinguishable as CC ionizes at m/z 241 and D4-CC at m/z 245. A specific amount of D4-CC is added to each vial in this experiment–monitoring both CC and D4-CC in the sample helps in understanding if the actual compound (CC) may have undergone any unintended modification or dilution indicated by a change in D4-CC levels. This work was supported by grants from the American Federation of Aging Research (to P.K. ), Larry L. Hillblom Foundation (to P.K. ), Boston Scientific Foundation (to M.S.) and the NIH (R01 AG038688 & R01 AG045835 to P.K. ; R21 DK091727 to P.K. and M.S. ; P20 DK100863 & R21 DE025961 to M.S.). We thank See Yang and David Hall for help with the assay setup. The cystine solubility assay presented here has been developed as part of our recent publication on the identification of α-Lipoic acid as a drug that prevents cystine kidney stones in a mouse model of cystinuria (Zee et al., 2017). We acknowledge the work by Rimer, J. D. et al. in Science (Rimer et al., 2010) that identified CDME to significantly increase cystine solubility and published an earlier version of the assay. Becker, G. and Caring for Australians with Renal, I. (2007). The CARI guidelines. Kidney stones: cystine stones. Nephrology (Carlton) 12 Suppl 1: S4-10. Dent, C. E. and Senior, B. (1955). Studies on the treatment of cystinuria. Br J Urol 27(4): 317-332. Koraishy, F. M., Cohen, R. A., Israel, G. M. and Dahl, N. K. (2013). Cystic kidney disease in a patient with systemic toxicity from long-term D-penicillamine use. Am J Kidney Dis 62(4): 806-809. Mattoo, A. and Goldfarb, D. S. (2008). Cystinuria. Semin Nephrol 28(2): 181-191. Milliner, D. S. and Murphy, M. E. (1993). Urolithiasis in pediatric patients. Mayo Clin Proc 68(3): 241-248. Palacin, M., Borsani, G. and Sebastio, G. (2001). The molecular bases of cystinuria and lysinuric protein intolerance. Curr Opin Genet Dev 11(3): 328-335. Rimer, J. D., An, Z., Zhu, Z., Lee, M. H., Goldfarb, D. S., Wesson, J. A. and Ward, M. D. (2010). Crystal growth inhibitors for the prevention of L-cystine kidney stones through molecular design. Science 330(6002): 337-341. Saravakos, P., Kokkinou, V. and Giannatos, E. (2014). Cystinuria: current diagnosis and management. Urology 83(4): 693-699. Sumorok, N. and Goldfarb, D. S. (2013). Update on cystinuria. Curr Opin Nephrol Hypertens 22(4): 427-431. Zee, T., Bose, N., Zee, J., Beck, J. N., Yang, S., Parihar, J., Yang, M., Damodar, S., Hall, D., O’Leary, M. N., Ramanathan, A., Gerona, R. R., Killilea, D. W., Chi, T., Tischfield, J., Sahota, A., Kahn, A., Stoller, M. L. and Kapahi, P. (2017). α-Lipoic acid treatment prevents cystine urolithiasis in a mouse model of cystinuria. Nat Med 23(3): 288-290. How to cite: Bose, N., Zee, T., Kapahi, P. and Stoller, M. L. (2017). Mass Spectrometry-based in vitro Assay to Identify Drugs that Influence Cystine Solubility. Bio-protocol 7(14): e2417. DOI: 10.21769/BioProtoc.2417.